A flat organizational structure is taken to be the most typical organizational structure. It has few management levels, with each level controlling a group of executives. Designing a flat organizational chart involves many different elements that can be managed using ConceptDraw DIAGRAM The 25 Typical Orgcharts solution is a paid add-on for ConceptDraw DIAGRAM, that providing you with the possibility to develop organizational charts quickly and easily, at an economical price. Select the “Flat Organizational Chart” template from the list. Arrange the elements of the organizational chart to your specifications by dragging them to a new location. Click the object in the organizational chart to which you want to add a description and then enter the text. You can add new objects to the chart by dragging them from a library to the document page. Connect the added objects using the Smart Connectors tool . 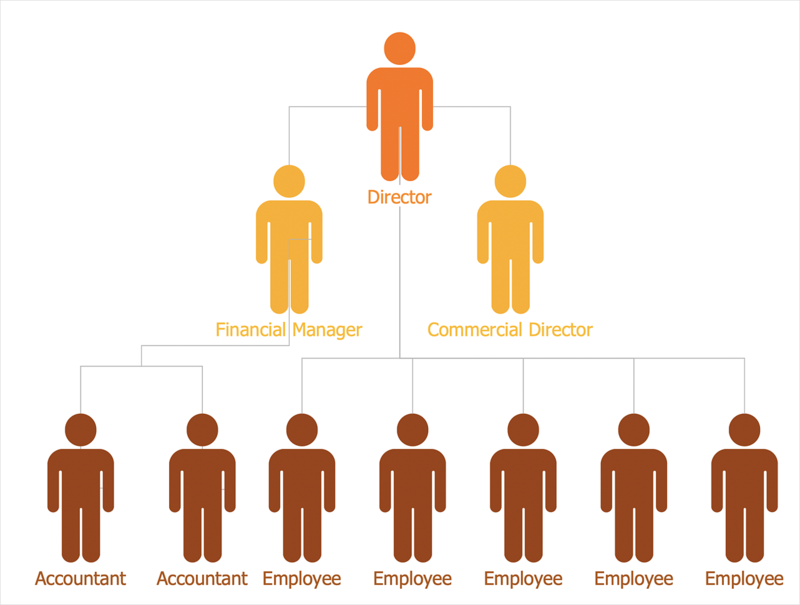 Result: A clear and focused organizational chart helps you understand the relationships of positions within an organization, in terms of both authority and responsibility.